Earlier this year, Senators Susan Collins (R-ME) and Tammy Baldwin (D-WI) re-introduced the Recognize, Assist, Include, Support, and Engage (RAISE) Family Caregivers Act (S. 1028) in the U.S. Senate. Senators Lisa Murkowski (R-AK) and Michael Bennet (D-CO) are original co-sponsors. This legislation, which AHCA/NCAL supports, would implement the federal Commission on Long-Term Care’s bipartisan recommendation that Congress require the development of a strategy to support family caregivers. The bill would create an advisory body to bring together representatives from the private and public sectors to advise and make recommendations. The strategy would identify recommended actions that communities, providers, government, and others are taking and may take to recognize and support family caregivers and be updated. On Tuesday, September 26, of last week, the full U.S. Senate considered and passed this legislation with an amendment in the nature of a substitute by unanimous consent. The amendment in the nature of substitute is consistent with The RAISE Family Caregivers Act - H.R. 3759 recently introduced in the U.S. House of Representatives. The legislation now awaits full House consideration. AARP notes that about 40 million family caregivers provide about $470 billion annually in unpaid care to their loved ones. According to the Caregiving in the U.S. 2015 study from the National Alliance for Caregiving and AARP, about 3.7 million family caregivers provide care to a child under age 18 because of a medical, behavioral, or other condition or disability, and 6.5 million family caregivers assist both adults and children. Members can keep music alive in their communities through music offered by Mood Media at AHCA/NCAL member-only discounted rates. Mood Media offers great musical variety for events or casual common area listening via the internet or streaming, and offers customized commercial free music options that allow facilities to tailor musical selections to meet changing resident preferences. Mood customers enjoy freedom from music licensing worries on Mood Media’s huge collection of music selections played on Mood Media‘s portable devices. Provide musical entertainment for social gatherings and happy hours. AHCA/NCAL members receive exclusive discounted rates on Mood services and equipment with three-year agreements.The core music package starts at $29.99 per month or about $1 per day with a three-year agreement. For more information about Mood Media’s services, call 800-345-5000 or visit the website here and use the password, "moodpartner". Attendees at the 68th annual AHCA/NCAL Convention and Expo in Las Vegas will have the opportunity to learn how American Nurses Credentialing Center (ANCC) board certification correlate with improved outcomes in long term care. A one-hour session titled “My RN is Smarter Than Your RN: Case Study Benefits of the Gero Nurse Program” will be held on Tuesday, October 17 at 10:00 a.m. Pacific. This session will feature four speakers who will detail how board certification in gerontological nursing is attained and the positive impact certification can have on quality and financial performance. AHCA/NCAL convention attendees are encouraged to attend this important education session and learn how to help RNs maximize their geriatric nursing strength and positively impact financial and quality performance. More information on this session can be found here. AHCA/NCAL Gero Nurse Prep is designed to prepare RNs to take the ANCC board certification exam in gerontological nursing. RNs who complete the Gero Nurse Prep program have a passing rate of 96 percent on the ANCC exam on their first try and they also receive 30 CEUs. But AHCA/NCAL Gero Nurse Prep does much more- it increases RNs’ knowledge of gerontological nursing practice. Gero Nurse Prep students see a whopping 23 percentage point increase on average on their pre- and post-test scores. ANCC is the world’s largest and most prestigious nurse credentialing organization and a subsidiary of the American Nurses Association. Less than one percent of America’s RNs are board certified in gerontological nursing, which means that having an ANCC Board certified RN can easily give providers an edge in the marketplace. Watch this video to learn more about AHCA/NCAL Gero Nurse Prep or click on the course preview to get a quick overview of this engaging online curriculum designed to help RNs pass the ANCC exam. AHCA is ready to help members meet the new Infection Preventionist specialized training requirement finalized by CMS in the Reform of Requirements of Participation for Long Term Care Facilities. This Infection Preventionist Specialized Training (IPCO) course provides education for healthcare professionals who seek to serve as Infection Preventionists. Individuals who complete the course will be trained to effectively implement and manage an Infection Prevention and Control Program (including antibiotic stewardship programs) at their nursing facilities. As of November 28, 2016, nursing facilities are being held accountable to more expansive infection prevention and control federal regulations. Beginning November 28, 2017, the federal requirements for nursing facilities expand further and require every nursing facility to develop and implement an antibiotic stewardship program. This is a new requirement that should be conducted with oversight from specially trained healthcare professionals. Surveyors nationwide were trained this summer to survey for the expanded infection prevention and control and antibiotic stewardship requirements. The course is an online, self-study program with 23 hours of training. It includes online lectures, case studies and interactive components taught by subject matter experts who have real life experience working in long term and post-acute care. It addresses both clinical and organizational systems, processes and cultural aspects of infection prevention and control that are fundamental to effectively leading and administering successful infection prevention and control programs and antibiotic stewardship programs. Upon successful completion of this program, participants will receive certificates including 23 ANCC contact hours. The training course registration fee is $450 for AHCA/NCAL members and $650 for non-members. There are no refunds and no transfers. Payment and registration must be made on ahcancalED. The IPCO course can be accessed at https://educate.ahcancal.org/p/ipco. Discounted group purchase rates are available for groups of 25 or more. Those interested in making a group purchase should email AHCA at educate@ahca.org. To access ahcancalED and the IPCO course, members will need to login with their AHCA/NCAL usernames and passwords. For assistance obtaining AHCA/NCAL usernames and passwords, please e-mail update@ahca.org with your name and facility contact information. Hospitalizations pose significant risks for frail older adults, including exposure to infection, delirium, functional loss and further complications. Hospitalizations are costly, particularly when an individual is unnecessarily hospitalized at the end of life. Knowing the person, understanding their goals and wishes are key to providing the best quality of life and quality of care. Centers interested in reducing unnecessary hospitalizations in long stay settings are invited to join this webinar, led by speaker Dr. Cari Levy, Professor of Medicine, Division of Health Care Policy & Research, University of Colorado, to learn more. Cari Levy, MD, Professor of Medicine, is a board-certified internist, geriatrician and health services researcher. Her research focuses on end-of-life care in nursing homes. Dr. Levy graduated from Pepperdine University with a degree in biology in 1993. She then attended medical school at the University of Colorado Denver. Dr. Levy began her internal medicine residency at Vanderbilt University in 1997 and served as Chief Resident in 2001. She then returned to Colorado for a fellowship in geriatrics. Following fellowship, she became an assistant professor in the Division of Health Care Policy and Research. She has published research regarding end of life care in nursing homes and physician practice patterns in nursing homes. The Department of Health and Human Services Office of Inspector General (OIG) has updated its 2017 work plan, which it has begun updating monthly. OIG has added plans to review implementation of a new rule for health facilities’ life safety and emergency requirements, which affect nursing centers and intermediate care facilities for individuals with intellectual disabilities (ICF/IID). The rule requires specific types of providers to install expanded sprinkler and smoke detector systems to protect residents from the hazards of fire, and to develop an emergency preparedness plan that facilities must review, test, update, and train residents on annually. The plan must include provisions for sheltering in place and evacuation. OIG is reviewing this area because these residents are particularly vulnerable to the risk of fires, since many of these residents have limited or no mobility. OIG intends to determine if these providers that received Medicare or Medicaid funds complied with new federal requirements for life safety and emergency preparedness for the period May 4, 2016, through November 15, 2017. Senate Majority Leader Mitch McConnell announced Tuesday that the Senate would not vote on the Graham-Cassidy legislation, the latest attempt to repeal and replace the Affordable Care Act (ACA). Chances of passage were dealt a significant blow earlier this week when Susan Collins (R-ME) announced she would join her fellow Republican Senators John McCain of Arizona and Rand Paul of Kentucky in opposition to the bill. Republicans could only afford to have two defections and still reach the 50-vote threshold for passage, with Vice President Mike Pence breaking the tie. The Graham-Cassidy bill cut billions from the Medicaid program by instituting population-based per-capita caps and cutting the allowable provider tax rate from six to four percent. AHCA/NCAL advocates sent hundreds of thousands of letters to Capitol Hill asking lawmakers to preserve Medicaid funding for long term care during the repeal and replace process, including over 13,000 in the last week alone. Senate Republicans revived repeal and replace efforts in recent weeks due to an announcement from the Senate parliamentarian that the budget reconciliation window will close on at the end of the fiscal year, September 30. The budget reconciliation process allows Senators to pass legislation with a simple 50-vote majority, rather than the 60-vote supermajority needed to avoid a filibuster. Despite the current budget reconciliation window closing at the end of the month, Republicans said repeal and replace efforts will not conclude. Many Republicans have suggested they would like to use the next fiscal year’s budget to pursue tax reform, but there is nothing procedural stopping Republicans from reviving repeal efforts in the future. You have the opportunity to nominate yourself or another member to serve on one or more of the following committees: Business Management, Clinical Practice, Constitution and Bylaws, Credentialing, Customer Experience, Emergency Preparedness, Health Information Technology, Independent Owner Council, Intellectual and Developmental Disabilities (ID/DD) Residential Services, Legal, Life Safety, Not for Profit Council, Political Action and Involvement (PAIC), Quality Improvement, Regional Multifacility Council, Reimbursement, Survey/Regulatory, and Workforce. Nominations are due by October 20th. All AHCA members are highly encouraged to participate in this process. In an effort to create diverse and widespread representation, appointments to specific committees may be limited to one participant per state and company. To assist in the process, individuals should be nominated for up to three committees and rank their selections in order of preference. To submit your nominations, please complete the Survey Monkey. We appreciate your willingness to serve in any capacity and are committed to do everything we can to honor your committee selections. All 2018/2019 committee appointments will be for a two-year term. Appointments are finalized by the AHCA Board of Governors Chair. In order to keep committee sizes at optimal levels, applicants are likely to be assigned to just one committee. Please visit the AHCA website for a list of committee descriptions. 1. User Name and Password: If you have not done so already, please obtain an AHCA website user name and password on the website here. This is necessary to access the nomination materials on the AHCA website. 2. Current Committee Members: All current committee members who wish to be re-appointed for 2018/2019 must nominate themselves or have another member nominate them. If you have any questions regarding this process, please contact Christy Herle. We hope you will take this opportunity to be an active member! Hurricanes Harvey and Irma devastated many victims across the impacted states. AHCA/NCAL member facilities, staff, residents and families are still reeling from the consequences. In the wake of these natural disasters, there are also those who have emerged as heroes – those who have worked tirelessly to protect others, putting resident and patient safety first. AHCA/NCAL would like to recognize the heroes of the recent hurricanes and put a spotlight on what they have done for our members during these tough times. You have helped us in the past by submitting stories that show the dedication and commitment to our cause that certain individuals have demonstrated. Now, we’d like your support in acknowledging the heroes whose powerful efforts have helped skilled nursing center and assisted living communities during the hurricanes and have supported the healing process. No more than 250 words that captures the story of the hero’s actions and impact. Your contact information (email, phone number), the name of facility, and the city and state of the facility where the story takes place. Any photos or videos we can share to visually support your story. We would like to have an opportunity at our 68th Annual Convention & Expo on October 15-18 in Las Vegas to recognize the heroes from Hurricane Harvey and Hurricane Irma that are revealed through the story submission process. Any stories submitted that are not considered to be highlighted at our Convention may be shared by AHCA/NCAL in other ways. Any questions may also be submitted to ahcapressoffice@ahca.org. For more information on Hurricane Relief, please visit the AHCA/NCAL Hurricane Relief website here. AHCA/NCAL has launched a web page dedicated to helping the victims of Hurricane Harvey and Hurricane Irma. Association members can find information about how to contribute to the Heroes of Long Term Care Hurricane Relief Fund, established by the Texas Health Care Association (THCA) Education Fund, for those in Texas. In addition, a fund is currently in development for Florida's Hurricane victims. Members should stay tuned for more information on how to help the victims of this devastating event. Information and resources will be added to the web page as they become available. Visit the AHCA/NCAL Hurricane Relief webpage here. All NCAL members are highly encouraged to participate in this process. In an effort to create diverse and widespread representation, appointments to specific committees may be limited to one participant per state and company. To assist in the process, individuals should choose two committees and rank their selections in order of preference. To submit your nominations, please complete the Survey Monkey. We hope you will take this opportunity to be an active member! After September 21, on-site registration fees apply, but you may register in-person beginning Sunday, October 15 at 6:45 am in the Mandalay Bay CC Foyer. Don't miss all the exciting offerings at this year's Convention & Expo. It's the long term and post-acute care event that has everyone talking. You'll go home energized and excited to tackle your toughest challenges. The goal of this web seminar is to review how HIPAA and its Privacy Rule permits the sharing of patient information with family members, friends and caregivers, as well as the components of the HIPAA right-of-access and ways in which it enables individuals and their caregivers to be more involved in their own care. · Describe how the HIPAA right of access enables individuals and their caregivers to become more involved in their care. For this webinar series, the Administration for Community Living’s National Alzheimer’s and Dementia Resource Center has partnered with the American Society on Aging. Please note, complimentary CEUs are available through this webinar. In addition, the webinar will be recorded and available for viewing at nadrc.acl.gov. CMS provides information on the Confidential Feedback Reports for the claims-based measures adopted for the Skilled Nursing Facility Quality Reporting Program (SNF QRP). These reports will be made available to SNFs via providers’ Certification and Survey Provider Enhanced Reporting (CASPER) folders in early October 2017. Information will be presented on the claims-based IMPACT Act measures included in the reports and direct participants to measure specifications. For more information, visit the SNF Quality Reporting Program Training webpage. Registration deadlines are approaching, and it’s looking like NCAL Day could be one of the most attended yet. Don’t miss out on the fun! Join your assisted living peers for a full day of stimulating education and networking on Sunday, October 15 during AHCA/NCAL’s Convention and Expo. In its 11th year, NCAL Day will feature keynote speaker, Dr. Rishi Manchanda. A physician and public health innovator, Dr. Manchanda believes in finding the root causes of illness, or looking upstream rather than simply treating the symptoms. A panel comprised of a diverse set of assisted living providers will close out the day with a discussion on the latest topics in senior care. With your ticket to NCAL Day, you are also invited to the NCAL Luncheon and Awards Ceremony where those who touch the lives of residents every day will be honored. Spend another day in Vegas and get a head start on how to improve your assisted living organization. NCAL Day is a separately ticketed event that you can add on to your registration package. AHCA is ready to help members meet the new Infection Preventionist specialized training requirement finalized by the Centers for Medicare and Medicaid Services (CMS) in the Reform of Requirements of Participation (RoP) for Long Term Care Facilities. AHCA’s Infection Preventionist Specialized Training (IPCO) course provides education for health care professionals who seek to serve as Infection Preventionists and prepares individuals to meet the antibiotic stewardship requirements taking effect in November 2017. As of November 28, 2016 nursing facilities are being held accountable to more expansive infection prevention and control federal regulations. Beginning November 28, 2017, the federal requirements for nursing facilities expand further and require that every nursing facility develop and implement an antibiotic stewardship program. This is a new requirement that should be conducted with oversight from specially trained healthcare professionals. Surveyors nationwide are being trained now to survey for the expanded infection prevention & control and antibiotic stewardship requirements. The course is an online, self-study program with 23 hours of training that meets the educational requirements outlined by CMS. It includes online lectures, case studies and interactive components taught by subject matter experts who have real life experience working in long term and post-acute care. AHCA’s course addresses both clinical and organizational systems, processes and cultural aspects of infection prevention and control that are fundamental to effectively leading and administering successful infection prevention and control programs and antibiotic stewardship programs. Upon successful completion of this program, participants will receive certificates including 23 ANCC contact hours. The training course registration fee is $450 for AHCA/NCAL members and $650 for non-members.There are no refunds and no transfers. Payment and registration must be made online in ahcancalED. The IPCO course can be accessed here or at: https://educate.ahcancal.org/p/ipco. To access ahcancalED and the IPCO course, members will need to login with their AHCA/NCAL usernames and passwords. For assistance obtaining AHCA/NCAL usernames and passwords, please e-mail update@ahca.org with your name and facility contact information. Earlier this year, Senators Susan Collins (R-ME) and Tammy Baldwin (D-WI) re-introduced the Recognize, Assist, Include, Support, and Engage (RAISE) Family Caregivers Act (S. 1028) in the U.S. Senate. Senators Lisa Murkowski (R-AK) and Michael Bennet (D-CO) are original co-sponsors. This legislation, which AHCA/NCAL supports, would implement the federal Commission on Long-Term Care’s bipartisan recommendation that Congress require the development of a national strategy to support family caregivers. The bill would create an advisory body to bring together representatives from the private and public sectors to advise and make recommendations. The strategy would identify specific actions that communities, providers, employers, government, and others can take to recognize and support family caregivers and be updated. Last Congress, the full U.S. Senate considered and passed this legislation. It did not come up for full U.S. House of Representatives’ consideration though before the end of last Congress. On May 11, 2017, the U.S. Senate Committee on Health, Education, Labor & Pensions (HELP) considered and approved this legislation by unanimous voice vote. It now awaits full Senate consideration. Most recently and last week, a similar version of the RAISE Family Caregivers Act (H.R. 3759) was introduced in the U.S. House by Representatives Harper (R-MS) and Castor (D-FL) with Reps. Lujan Grisham (D-NM) and Stefanik (R-NY) as original cosponsors. It awaits full House consideration. According to AARP, about 40 million family caregivers provide about $470 billion annually in unpaid care to their loved ones. According to the Caregiving in the U.S. 2015 study from the National Alliance for Caregiving and AARP, about 3.7 million family caregivers provide care to a child under age 18 because of a medical, behavioral, or other condition or disability, and 6.5 million family caregivers assist both adults and children. The Research Triangle Institute (RTI) International conducted a study which examined the potential impact wage increases would have on assisted living (AL) and continuing care retirement communities (CCRC). RTI researchers examined the impact of raising the hourly minimum wage to $10, $12, and $15 per hour. The report includes the number of AL and CCRC workers who would be impacted by minimum wage increases and the average wage increases per worker, both nationally and in select states. Researchers also examined the impact to providers, including the average total cost increase in the direct labor costs per worker and across workers. The report found that the average financial impact of a $10 or $12 minimum wage would be 1 percent and 5 percent in total costs, respectively. Overall, a $15 minimum wage would increase provider costs by a roughly 13 percent. This study was conducted in a partnership between RTI International and the Center for Excellence in Assisted Living (CEAL). NCAL Senior Director of Workforce & Quality Improvement Lindsay Schwartz, Ph.D., is Board Chair of CEAL. “There is a constant need to attract and retain staff who can provide quality care, and there’s also the challenge of keeping costs affordable for individuals and families who rely on these communities,” said Schwartz. Read the complete report “Impacts of Potential Minimum Wage Increases on Assisted Living and Continuing Care Retirement Communities”. Free test drives are available for HealthCare Interactive’s CARES® online dementia care training programs and the Alzheimer’s Association essentiALZ® individual certification programs. CARES® is recommended by the American Health Care Association/National Center for Assisted Living to help reduce the off-label use of anti-psychotics and the online training program is available 24/7. These online training programs, offered by leaders in the dementia care field, are available to AHCA/NCAL members at a 10 percent discount. Use the code AHCA10 at checkout to apply your 10 percent savings off any individual course or site license purchase. Each program is unique with different video and narrative educational content that teaches the learner about all stages of thinking decline, different approaches, and person-centered care. To test drive any of the CARES® programs, go to www.hcinteractive.com/testdrive. There are 18,814 open jobs posted by direct employers this month in the nursing care facility (including skilled nursing facilities), assisted living, and continuing care retirement community (CCRC) sectors this month according to the latest CEB TalentNeuron statistics. The number of open jobs posted nationwide by direct employers decreased by more than 1,600 since August. The CEB TalentNeuron statistics also show an estimated 2,101,000 potential candidates in the nation’s workforce whose skills likely match the qualifications being sought by long term care employers. Figures show that 1,855 direct employers are competing for candidates this month – a decrease of more than 200 employers over August figures. The average number of days a job was posted this month decreased by one day to 36 days. Finding qualified employees is one of the greatest challenges facing long term care providers. The AHCA/NCAL Long Term Care Career Center is designed to help members be competitive in attracting qualified candidates to fill their health care job vacancies. The LTC Career Center is also fully integrated with Google’s new job search feature “Google for Jobs”, creating even greater exposure for job postings. Rates for posting job vacancies are affordable and give prospective employers far greater exposure than local ads and job boards by connecting to a network of more than 330 national and state health care organizations and societies. Employers are also able to post vacancies as they occur and search resumes on the network. There are two great ways for skilled nursing center and assisted living employers to save on their job postings on the Long Term Care Career Center. First-time job posters can receive 25 percent off their first posting by entering promo code New25off when they check out. Employers with multiple positions to fill can purchase three job postings at one time and receive a 20 percent discount on the three postings by entering promo code Bundle20 at check out. Of course, the LTC Career Center is always free for job seekers. And, job seekers are using the site with more than 91,000 searchable resumes on the National Healthcare Career Network this month. Job postings on the AHCA/NCAL Long Term Care Career Center network are averaging more than 1,500 views in September. Employers who utilize the site also receive outstanding exposure through rotating job listings on AHCA’s home page – the website where long term care professionals go for news and information. In addition, employers who post vacancies through the center receive bonus rotating listings on the Long Term Care Career Center home page. Be seen nationwide. Check out the LTC Career Center today and remember to use one of the two promo codes to save on your job postings. AHCA/NCAL Convention & Expo: Advanced Registration Deadline is Tomorrow! Get all the details and register for the convention package that is right for you. Today, AHCA/NCAL announced that three long term and post-acute care providers have earned the 2017 Gold – Excellence in Quality Award. The award is the final of three distinct levels possible through the AHCA/NCAL National Quality Award Program, which recognizes organizations nationally that serve as models of excellence in providing high-quality care. Based on the core values and criteria of the nationally recognized Baldrige Performance Excellence Program, the AHCA/NCAL National Quality Award Program challenges member providers to achieve performance excellence through three progressive levels—Bronze, Silver, and Gold. The Gold – Excellence in Quality Award is the most prestigious of the program. At this level, recipients have invested multiple years in mastering and applying the rigorous quality improvement standards of the Baldrige Criteria to achieve superior results in leadership, strategic planning, customer and workforce focus, and operations and knowledge management. Since the inception of the National Quality Award Program in 1996, only 31 long term and post-acute care providers have achieved this level of quality recognition, apart from this year’s recipients. AHCA/NCAL announced the recipients of the Bronze – Commitment to Quality on June 1 and Silver – Achievement in Quality on July 6. A full list of recipients is available on the AHCA/NCAL Quality Award website here. The program is sponsored by AHCA/NCAL Associate Business Members: First Quality, NRC Health, and Team TSI Corporation. The awards will be presented during AHCA/NCAL’s 68th Annual Convention and Exposition in Las Vegas, Nevada, October 15-18, 2017. To learn more about the National Quality Award Program, visit the program website here or email qualityaward@ahcancal.org. Senate Republicans this week renewed efforts to repeal and replace the Affordable Care Act (ACA), coalescing around a plan championed by Senators Lindsey Graham (R-SC) and Bill Cassidy (R-LA). The legislation, known as Graham-Cassidy, is similar to past attempts to overhaul the health care system in that it sets federal funding restrictions on Medicaid and devolves significant insurance market authority to states. The plan cuts billions from Medicaid by placing per-capita caps on spending based on population group and reducing the maximum allowable provider tax rates from six percent to four percent. The Senate only has a limited time frame to vote on the legislation. The reconciliation window that allows the Senate to pass the legislation with a simple 50 vote majority expires at the end of the month. AHCA/NCAL is urging all of its members and advocates to call their members of Congress and urge them to oppose this legislation. Advocates can use the Care Advocacy resource to easily locate and contact Members of Congress. There is also member webinar on Wednesday, September 20 at 5 p.m. Eastern to provide more information about the details of this proposal. Click here to access the webinar. 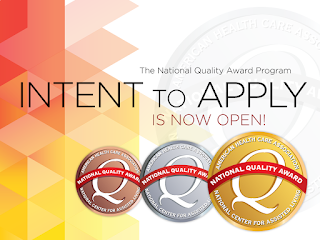 The Intent to Apply process for the 2018 AHCA/NCAL National Quality Award application cycle is now open. The deadline to submit an Intent to Apply payment is Thursday, November 9 at 8 p.m. Eastern. The Intent to Apply is not mandatory to apply for the Quality Award, but members who submit an Intent to Apply benefit by saving money on their overall application fee and receive weekly tips on submitting a successful application. All applicants should read the application packet in full before submitting an Intent to Apply payment. If your center last received a Bronze or Silver Quality Award in 2015 and has not submitted an application meeting minimum requirements since then, this is your last year to submit an application at the next level. If you do not submit an application this year, you will be considered a past recipient and have to resubmit at the Bronze level if your center chooses to participate again in the program. For more information, please review the recertification policy here. 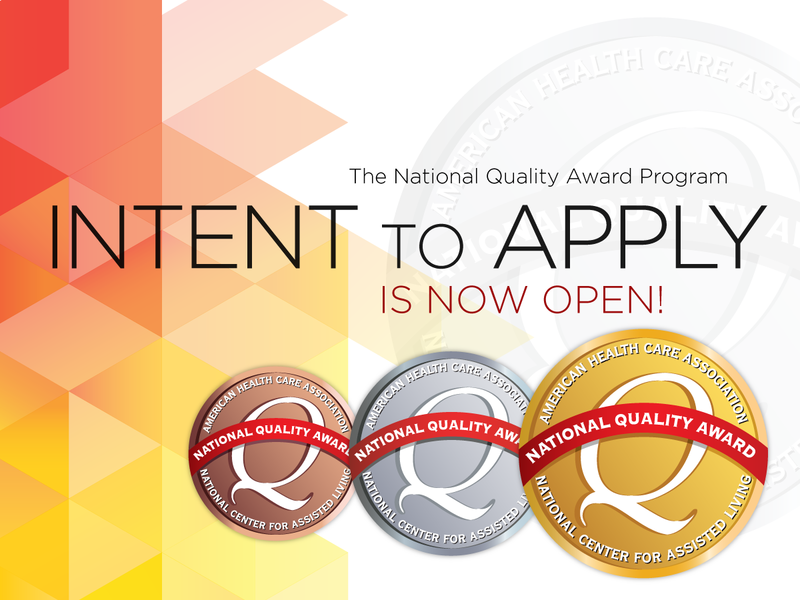 The National Quality Award website has numerous resources for applicants. Please make sure to visit our website at ahcancal.org/qualityaward to learn about the latest updates to the program. If you would like to review your center's award history or have any questions, please feel free to contact us at qualityaward@ahca.org. As the executive director of the National Center for Assisted Living, I’m constantly visiting our state affiliates and member companies across the country. Touring assisted living communities is one of my favorite things while I’m out on the road. Seeing how providers are innovating senior care down to the finest details is truly inspiring. But most invigorating is the ability to talk one-on-one with direct caregivers. You’ll hear a consistent phrase among assisted living staff, “They’re like my family.” This comes from staff at every level; from administrators to housekeeping and maintenance. Now through Saturday is the biggest week of the year – National Assisted Living Week! The national observance (which begins each year on National Grandparents Day) honors the individuals served, as well as the individuals who serve, in assisted living and residential care communities across the nation with special activities and events. · Keep track of your activity calendar and collect all photos from the week. 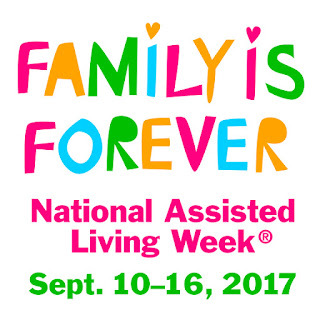 You could use them to apply for the National Assisted Living Week Programming Award as part of the NCAL Awards Program in 2018. Please join the American Assisted Living Nurses Association (AALNA) and National Center for Assisted Living (NCAL) for the third quarter Caring Together Webinar, September 20th 3-4pm Eastern. This webinar will cover topics on best practices for medication management in Assisted Living. The importance of the role of the AL nurse and consultant pharmacist for medication management in assisted living will be discussed. Other topics will include antibiotic stewardship, appropriate use of psychotropic agents, and review of the updated Medication Administration Pocket Guide co-developed d by the Center for Excellence in Assisted Living (CEAL), the American Society of Consultant Pharmacists (ASCP) and MED-PASS. Presenters will be Joan Baird, PharmD, BCGP, FASCP, Director of Pharmacy Practice and Government Affairs with the American Society of Consultant Pharmacists and Loretta Kaes, RN, B-C, C-AL, LNHA, CALA, Director of Quality Improvement and Clinical Services with the Health Care Association of New Jersey. You can pre-register for the webinar here. The NCAL is pleased to announce the relaunch of the Quality Initiative Recognition Program to honor assisted living members for their individual work in achieving the goals of the NCAL Quality Initiative. All achievers will be recognized at the AHCA/NCAL Quality Summit in New Orleans, March 12-14, 2018. For assisted living communities, members must submit data for all NCAL goals in LTC Trend Tracker by October 13, 2017. Customer satisfaction vendors can upload data to LTC Trend Tracker on behalf of members. A list of vendors able to upload can be found here. Later this year, achievers will be notified by the AHCA/NCAL Quality Initiative Recognition Program team using the latest available data. In the meantime, if you need assistance with LTC Trend Tracker, email help@ltctrendtracker.com and be sure to add the email address to your Safe Sender list. If you are also a skilled nursing provider, your SNF may also be recognized for meeting the goals of the AHCA Quality Initiative. Learn how to participate in the AHCA Quality Initiative Recognition Program. According to a September 7, 2017, email update from Medicaid.gov, “the Centers for Medicare & Medicaid Services (CMS) is providing guidance to states on how to treat ‘ABLE’ accounts in Medicaid financial eligibility determinations. The Stephen Beck, Jr., Achieving a Better Life Experience Act of 2014 (the ABLE Act), enacted in 2015, created a program under which people with disabilities can save money for their disability-related expenses in tax-advantaged accounts. Because disability can serve as a basis for Medicaid eligibility, many individuals who apply for Medicaid on the basis of having a disability may be interested in opening an ABLE account, and this letter provides guidance to states on the treatment of funds in, contributions to, and distributions from an ABLE account for purposes of Medicaid eligibility.” The letter is available here. AHCA supported the passage of the ABLE Act in Congress. President Trump signed a deal that funds the federal government and raises the debt ceiling late last week. The package extends government funding and the borrowing limit to December 8th. The deal also includes disaster relief for Hurricanes Harvey and Irma, funds flood insurance and aviation programs, and avoids a government shutdown, nearly clearing the deck for must-pass items this month. Trump surprised many when he announced the deal after meeting with leadership from both parties in the Oval Office last Wednesday. The move went against the wishes of Congressional Republican leadership, who wanted to tie the debt ceiling to reductions in government funding. The legislation advances quickly though both chambers, but relied on help from Democrats to make it to the president’s desk. 90 House Republicans voted against the package. Lawmakers still must address some key health care items this month. Funding for the Children's Health Insurance Program (CHIP) runs out at the end of September. Additionally, the parliamentary window for Republicans to pass health care reform with only a simple majority in the Senate concludes at the end of the fiscal year, September 30th. Administrators, directors, nurses and other long term care staff interested in quality dementia care are encouraged to register for a facilitated intensive training session led by national CARES® expert, Debbie Richman, to learn how to implement the CMS- and AHCA/NCAL-recommended CARES® online training program within your organization. At the end of the training session, attendees will be eligible for individual Alzheimer’s Association essentiALZ® certification. This unique learning opportunity at the 68th Annual AHCA/NCAL Convention and Expo in Las Vegas is back this year by popular demand. Attendees will complete the CARES® Dementia Basics curriculum and learn about the training tools, techniques, and activities to implement the CARES® Approach within your organization utilizing the CARES® Classroom Guide™ for Administrators and Educators. This session is a great way to help skilled nursing centers develop dementia specific educational programs that can help demonstrate staff competency in quality dementia care as part of the new staff competency assessments that will be required under Phase II of the CMS Requirements of Participation taking effect this November. Specialized training will be one way surveyors will determine if caregivers have the competencies necessary to deliver quality and individualized care. The CARES® content video-intensive and includes care vignettes and interviews of real people living with dementia, their families, professional caregivers, and dementia experts (no actors). In addition, this session will offer unique networking opportunities to learn from your dementia care colleagues from across the nation. The CARES® Dementia Basics Training is approved for 5.5 Administrator CEUs will be held on Sunday, October 15 from 8 a.m. to 4 p.m. and is a separate ticketed event. The registration fee for this special intensive training is only $199.95. As an added bonus, attendees will receive a complimentary copy of the CARES® Classroom Guide™ for Administrators and Educators – a $199.95 value – which offsets the entire cost of the session. Click here to register for the AHCA/NCAL Convention and Expo held October 15 – 18 in Las Vegas. AHCA/NCAL Gero Nurse Prep is designed to prepare RNs to take the American Nurses Credentialing Center (ANCC) board certification exam in gerontological nursing. It does that. RNs who complete the Gero Nurse Prep program have a passing rate of 96 percent on the ANCC exam on their first try and they also receive 30 CEUs. But AHCA/NCAL Gero Nurse Prep does much more. It increases RNs’ knowledge of gerontological nursing practice. Gero Nurse Prep students see a whopping 23 percentage point increase on average on their pre- and post-test scores. Attendees at the 68th annual AHCA/NCAL Convention and Expo in Las Vegas will have the opportunity to learn how Gero Nurse Prep and ANCC board certification correlate to improved outcomes in long term care. A one- hour session titled “My RN is Smarter Than Your RN: Case Study Benefits of the Gero Nurse Program” will be held on Tuesday, October 17 and will feature four speakers who will detail how board certification in gerontological nursing is attained and the positive impact certification can have on quality and financial performance. ANCC is the world’s largest and most prestigious nurse credentialing organization and a subsidiary of the American Nurses Association. Less than one percent of America’s RNs are board certified in gerontological nursing. That means having an ANCC Board certified RN can easily give providers an edge in the marketplace. To help increase the number of board certified RNs, AHCA/NCAL’s Gero Nurse Prep program is designed to help RNs prepare for and pass the ANCC gerontological certification exam. RNs who are interested can become board certified for less than $1,100 ($690 for AHCA/NCAL Gero Nurse Prep and a separate $395 to take the ANCC exam). Watch this video to learn more about AHCA/NCAL Gero Nurse Prep or click on the course preview to get a quick view of this engaging on-line curriculum designed to help RNs pass the ANCC exam. Maximize your nursing strength. Check out AHCA/NCAL Gero Nurse Prep today. The Office of Medicare Hearings and Appeals (OMHA) has announced that as a result of Hurricane Irma, all hearings from the Miami Field Office are cancelled for the remainder of the week through Friday, September 15. The Medicare hearings will be re-scheduled for a later date when the office resumes normal operations.